The White House’s internal war over Scott Brown, and Nancy Pelosi’s shocking cool. Nancy Pelosi was in the Old Executive Office Building when one of her advisers gave her a message: Obama wanted her next door, in the White House. Martha Coakley was about to lose the election for Ted Kennedy’s old seat and, with it, the Democrats’ filibuster-proof majority. Obama had summoned Harry Reid, too, and together they discussed options. Exactly who said what depends on who’s telling the story, but a few things seem clear: They all wanted to keep pursuing comprehensive reform, but they couldn’t agree on how. And they were all frustrated—with the political situation and, increasingly, with each other. It didn’t help that the original negotiations over merging the House and Senate bills had left nerves frayed. From afar, the bills looked similar: They had the same basic structure, the same basic scope, and the same kind of regulations. But, up close, their differences, starting with the choices for raising money, looked a lot bigger—and Pelosi, speaking for a caucus that already felt bloodied, hated giving every inch. Obama had personally taken charge of the negotiations, hauling everybody into the West Wing: “The president understood the issues better than many if not most House and Senate members,” said an impressed Henry Waxman. But, at one point, he got so exasperated he got up and left the room, leaving Rahm to knock some heads. The House and Senate were close to agreement when the Massachusetts special election interceded. By the time Obama was on his way to Boston in a last-ditch effort to change the outcome, his advisers had started talking about contingencies. But the election was more devastating than they had feared, the reaction among Capitol Hill Democrats even more panicked. On the night of the election, prominent House Democrats Barney Frank and Anthony Weiner told MSNBC they thought health care reform was effectively dead. According to senior Democratic aides, Pelosi figured that Massachusetts left her with a core of only about 180 Democrats sure to vote with her. She’d have to pick up the rest from a group that was divided among themselves. But, if Pelosi projected confidence, she had a major worry: Back at the White House, a debate over whether to proceed with comprehensive reform was playing out one more time. Rahm Emanuel was, once again, proposing to find a quick deal on a smaller bill that would insure just kids. And he wasn’t just talking it up internally. He’d discussed the idea with members of Congress, and, in February, The Wall Street Journal published a story about it. Whether Rahm was merely exploring the option or actively shopping it, Pelosi thought all the talk of an “eensy weensy bill,” as she called it, was undermining her efforts. She told the administration she needed Rahm to cease and desist. The internal debate was no secret at the White House, and, particularly in the first two weeks after Massachusetts, many administration officials assumed that health reform really was “Dead, DEAD DEAD,” as one put it to me in an e-mail. Officials also had their own frustrations with Pelosi: Once the smoke had cleared, all sides realized the only way forward was to have the House pass the Senate bill, and then amend the Senate bill using the reconciliation process. But Pelosi kept insisting the Senate go first, something administration officials thought unworkable as politics and policy. 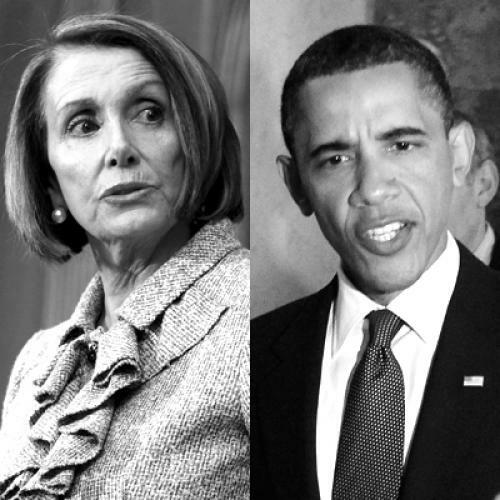 Pelosi had asked Obama and Reid not to pressure her publicly, lest they alienate more members; they were complying. But, privately, many administration officials feared Pelosi wouldn’t budge because she couldn’t—that votes in the House would never materialize. But, every time this debate reached the Oval Office, the president came down in the same place: He was elected to do the big things, and he wasn’t ready to give up. He told his cabinet, apparently referring to a Tom Toles cartoon in The Washington Post, that they were on the two-yard line—and he didn’t want to settle for a field goal. At a town-hall meeting, he gave an unscripted, 20-minute soliloquy on the importance of reform; at a House Republican retreat in Baltimore, he showcased Republican obstructionism and demonstrated the deep, intricate knowledge of policy that he memorably lacked three years before, at that Las Vegas SEIU forum. The Baltimore session went so well he called for another, more formal summit—with Democrats and Republicans. At that event, which took place at Blair House in late February, the Republicans acquitted themselves far better. But the summit itself was less important than the time it bought. “It just froze the game,” says John Podesta, president of the Center for American Progress. “Everybody just decided, ‘OK, let’s see what happens a month from now [at the summit].’ It stopped people from jumping ship.” (It also gave reformers a chance to publicize news about huge premium hikes by California’s WellPoint insurance.) Pelosi used the time to work on her members, while House staff—coordinating with their White House and Senate counterparts—quietly figured out how to write a bill that would fix the Senate package within the intricate rules of reconciliation. Reid worked his caucus, urging them to give Pelosi time and making sure 51 members would be ready to approve the reconciliation bill when the time came. There were familiar political hurdles, like the tax on benefits, which had become the critical piece for winning CBO validation of cost control. Obama agreed to scale it back, and then told the unions they'd have to take it. In the end, once again, it came down to abortion, because the Senate’s language was less restrictive than what Stupak had won. John Dingell reminded Stupak, to whom he’d been a mentor, how important reform was. Stupak relented, accepting an executive order that merely affirmed existing bans on taxpayer-funded abortions. By this time, House leadership and the White House were working as a team. Insiders from both camps observed that Obama and Pelosi seemed to be reinforcing one another—and, together, conjuring up a political miracle. To plenty of Americans, that was precisely the problem. The process of passing the law seemed ugly—there was plenty of “business as usual”—and the final product has flaws, too. The new law will not cover everybody, and, in the near future, neither the government nor the country will be spending less money on medical care. But it will mean insurance coverage for an additional 32 million people, as well as more reliable coverage for people who already have it. The extra spending it will require is a rounding error, and, within a few years, health care costs will be rising more slowly than they would have otherwise. History shows that, over time, we tend to make these laws better—by amending them with new legislation and strengthening them with regulation, something the Obama administration has already begun. As Senator Tom Harkin memorably put it in December, health care reform isn’t a mansion. It’s a starter home, with a solid foundation, a strong roof, and room for expansion. The basis for the law is the idea that everybody should be able to get the medical care they need without enduring financial calamity—and that government must act, aggressively, to make that happen. Conservative opposition to this says more about the right than it does about health reform. The Affordable Care Act’s intellectual lineage includes strong conservative influences; its coverage scheme is virtually identical to the one in Massachusetts,which, at the time, a Republican governor and conservative intellectuals supported. Liberals, of course, wish health care reform were more liberal—that, if it couldn’t be single-payer, then at least it could be bigger, stronger, and have a public option. As the argument goes, if only Obama, Pelosi, and Reid had pushed harder—if only they hadn’t made so many compromises—the bill would be better. But, as sympathetic as I am to that argument on substance, I’m skeptical that, with a different set of decisions, the Democrats could have produced a substantially better law. Some of this is because of things I learned, or at least came to appreciate, only recently. Take the role of Max Baucus. Of the key players in this debate, Baucus is probably the one most singularly responsible for pushing legislation to the right. But insiders, even those critical of him, will tell you that his early commitment to comprehensive reform—and his subsequent refusal to back off, even after setbacks—made enactment possible. It’s frustrating that conservatives hold so much sway over legislation, particularly when they deploy hypocrisy, demagoguery, and dishonesty. But the institutional constraints on legislation—the technical challenges of reconciliation, the accounting standards of the CBO, the nature of campaign finance—make the enactment of sweeping legislation nightmarishly difficult. Liberals frustrated with the Affordable Care Act’s final shape ought to concentrate on changing those facts of political life, by reforming institutions of government, starting with the filibuster, and building the kind of grassroots movement that can dilute the awesome power of money in politics. What’s most important to remember about the Democratic leaders is that they took on health care reform when the conventional wisdom said it was too politically risky—and then stuck with it when the conventional wisdom said it was time to give up. Particularly at the end, after Scott Brown, Reid could have said the Senate Democrats were through voting on health care, because that’s what much of his caucus was saying. Pelosi could have said the votes in the House just weren’t there, because, by all accounts, they weren’t. Obama could have said the country and most of the party just wanted to move on, because that’s what the country and most of the party was saying. But Obama, Reid, and Pelosi didn’t say any of those things. They pushed ahead. And, whether it was because of idealism, ego, a political hunch, or some combination, they got the job done. They inherited a crusade that liberals launched in the early twentieth century and carried it to completion—transforming life for tens of millions of Americans, reorganizing the most dysfunctional part of the U.S. economy, and proving that the United States can at least make a serious effort to solve its biggest problems. They were lucky, yes. They were also good. Click here to read parts one, two, three, and four. And click here to subscribe to TNR.For more TNR, become a fan on Facebook and follow us on Twitter.